Mit værk til I går- i dag - i morgen til jubilæumskonkurrancen i Dansk Patchworkforening 2011 lever sit eget lille liv. Det startede med at det blev belønnet som "runner up" af dommerpanelet. Efterfølgende blev det udtaget til at være med i Canada, hvor Dansk Patchworkforening var inviteret til at udstille i forbindelse med Ailsa Craig Community Festival som udstillede 110-125 danske quilts mm. Yesterday – to day – tomorrow. My name is Lisbeth Svenstrup. I have always been creative, but mostly used my creativity together with children. This is the first time ever I have participated in a competition. I am an absolute autodidact patchworker. It started in 2005, when we moved from Denmark to Hungary. I had to give up my job inDenmarkand follow my husband. 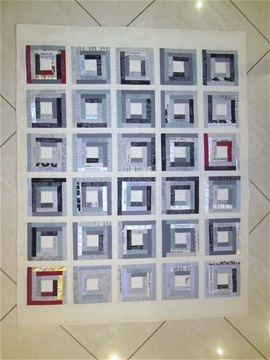 Therefore I started to learn my self patchwork from books I had bought. 2 years later I discovered the Danish Patchwork organization, joined them and thereby got there magazine. The same second I saw the competition theme in our magazine, I knew how I would make it – That was if I were to participate! My concern was; if I had the skills after just practice by my self? Then the next magazine came and I read an article from one of the judges appealing to everybody to give it at try. And in a moment of bravery I signed up. A few days later I received the material, and I started to search on the internet fore events in each year from 1986 to 2016. That was so much fun!! Sewing and embroidering of the plaid was also fun. But then came deadline, and I had to decide if I were to bail out or participate??? But by then I found a Hungarian patchwork group. They encouraged me. The doors patchwork can open are amazing. My plaid was rewarded as an upcoming, I have started to work for the Danish patchwork organizations magazine and my plaid is selected for this trip toCanada. I am so proud and grateful. Thank you so much!